French motorways (Autoroutes) are mostly toll roads. I’m British and live in Switzerland so over the years have frequently driven through The North-East of France between the UK and Switzerland. For a long time, I’ve had a toll transponder from the Sanef group who operate the tolls. This saves fumbling for Euro change or a credit card and results in a single, total charge on your credit card each month you use an Autoroute which is very convenient. 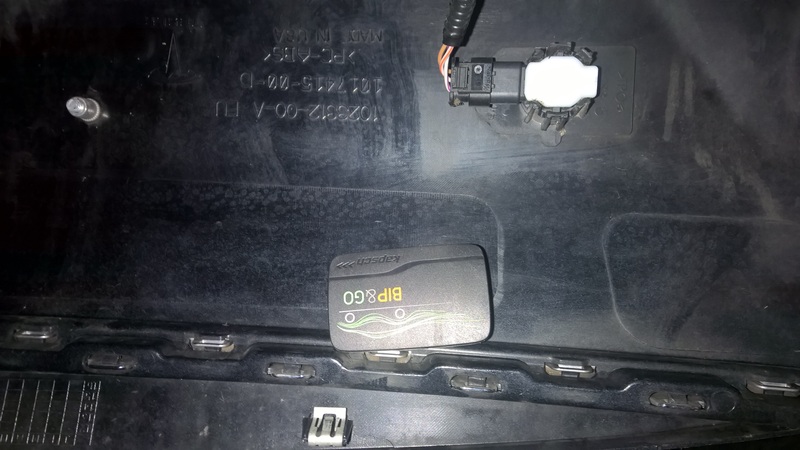 My old transponder stopped working so I thought I’d describe how I obtained a replacement en route, and how I fitted it invisibly to my Tesla Model S.
I actually stopped at one of the Sanef offices at a Péage (toll barrier) but before I describe that experience, it’s worth mentioning that Sanef has a site for UK residents only, in English at https://www.saneftolling.co.uk/. I also noted that the channel tunnel operators have a special combined deal at http://www.eurotunnel.com/uk/traveller-info/Sanef-Tolling/. You can read how pricing and charging works on one of those sites and I won’t discuss pricing any further in this article. Neither of these sites were useful for me as an existing, non-UK customer, so I needed to contact an office. There are about 18 of these in North-East France (map: http://www.sanef.com/mainapp/dev/gm/index3.php) but sometimes only on one side of a motorway! About 1Km before a Péage toll barrier (not one that is at an exit) look for a group of signs that indicate what’s at the Péage. You’re specifically looking for the “t” Telepéage logo along with the word “Agence” (agency, office). Go through the toll using a lane as far to the right as possible. This will be the last time you need coins or a credit card! IMMEDIATELY you exit the pay lane, drive very slowly and look for a parking area to the right, park and the office should be visible. I used the Agence at Saint-Avold, Eastbound in the direction of Saarbrücken. The opening hours are Mon-Fri, 7:30 to 19:30, which I believe is common to all the offices. You are after a “BIP&GO” transponder for Liber-T (that’s about all they sell)! This is a small white totally-sealed plastic block of electronics that is approximately 40mm x 20mm x 5mm thick, with a plastic clip that has double-sided tape and is intended to allow easy swapping between cars. My French is bad and the lady in the office and I both struggled until settling on German as our common language! They require a name, address and a credit card number – easy! As your card expires, they’ll email you to get an updated number/expiry. The “BIP&GO” transponder will be supplied in a radio-shield foil bag to stop it responding until you mount and use it on the car. Ensure you keep that bag to disable it if you ever need to! A display on the office counter shows that you should mount it beside the mirror on the glass area with black dots, but that only works in some variants of Model S! If you have a car built between September 2014 and September 2015 you either have to wind down the window and wave the tag through it, or install it inside the nosecone at the front of the car. I was warned that my replacement transponder might not work for an hour or so, but it actually worked immediately. Approaching the next toll, I had cash, cards and an open sunroof to prepare for all possibilities! Go for a lane that accepts cash or cards – if there is a “t” above the lane then the transponder can potentially also be used. I temporarily pressed and held the transponder in place high up, to the right and just beside the mirror– nothing! So I held it out the opened roof and – immediate success. OK, the rumours I’d read about the Model S being potentially toll-pass unfriendly seemed true. Immediately after the toll I pulled over to a car park. Most modern cars have a metallic film on the inside of the windscreen glass, to reflect heat and UV radiation while allowing visible light through. This film has the annoying habit of blocking signals from mobile phones, GPS devices, and radio toll tags, so manufacturers usually provide a small dotted or shaded area at the top of the screen where the metallic foil isn’t fitted, so that a tag can be placed without its signal being blocked. 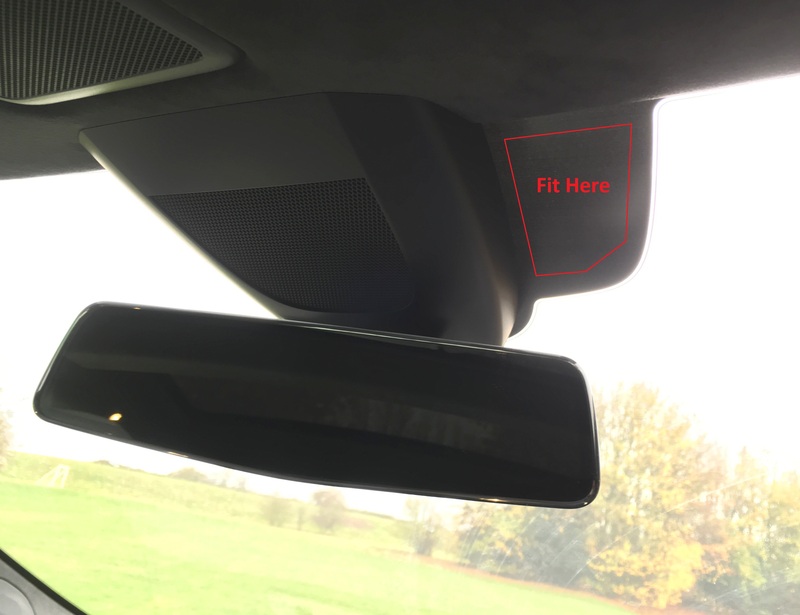 Tesla provided such an area with their pre-Autopilot cars, and also on recent (built from September 2015 onwards) Autopilot cars, but cars built between September 2014 and September 2015 do not have a space to fit a tag; the metallic layer covers the whole windscreen with no gap for a signal to get through. 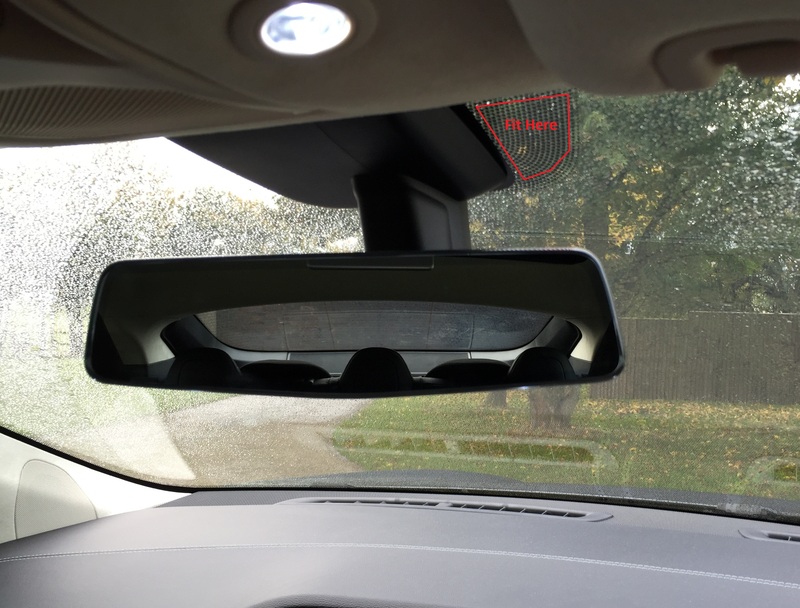 In early cars there’s a clear dotted area to the side of the rear view mirror mount, where a tag can be placed. Early autopilot cars have no area where a tag can be placed – there’s a thin zone of dots along the whole of the top of the windscreen but it doesn’t appear to be transparent to RF, so signals do not get through. In recent cars there’s a clear solid black ares to the side of the rear view mirror mount, where a tag can be placed. 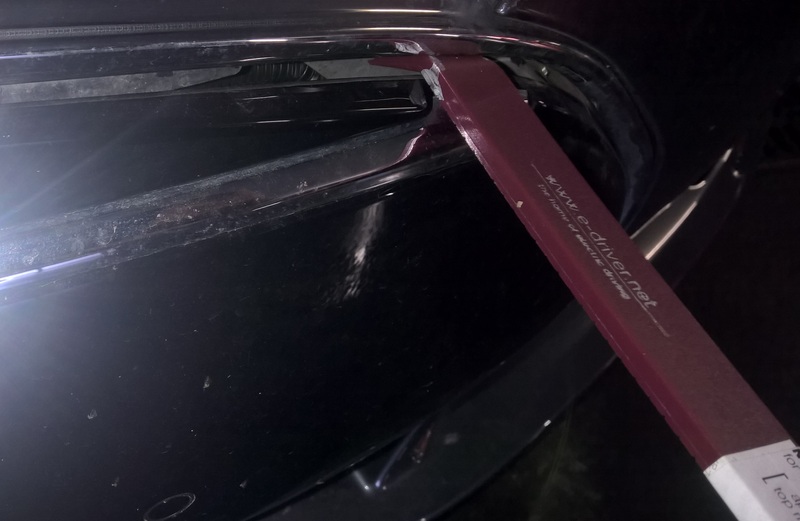 Last year, when I was trying to bear my Tesla-waiting I bought a few accessories including a plastic gizmo to easily remove the nose cone. A few seconds after parking I’d popped open the top clips, which is sufficient. The Sanef office give you alcohol-soaked cleaning tissues so locating a flattish area inside the nose cone directly between the (metal) number plate and a park sensor, I cleaned and affixed the BIP&GO to the inside of the nosecone. The whole job took less than 5 minutes. Obviously you then cannot use the quick-change clip in more than one car! In this picture you’re looking at the front of the car from the outside. 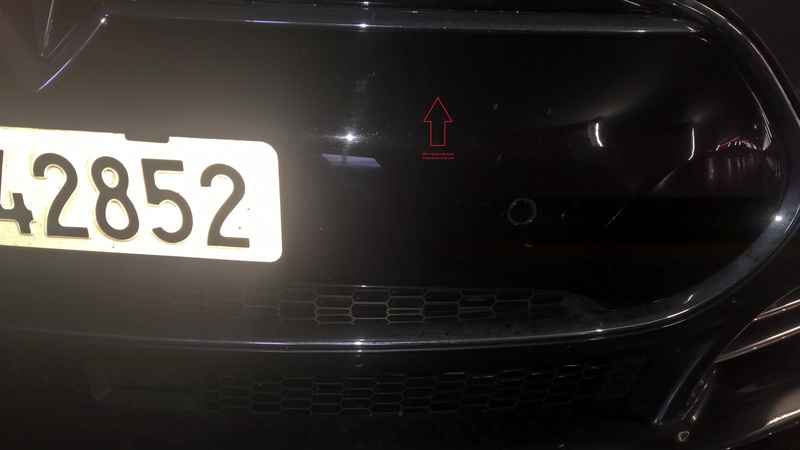 The transponder will be mounted on the inside surface of the nosecone, mid-way between the edge of the licence plate and nearest parking sensor, preferably above centre line of nosecone so that it is angled upwards. Use a SOFT PLASTIC lever to pry nose cone off, starting top right. This is good practice if you ever need to attach the towing eye! This viewpoint is looking down on the inside of nose cone folded downwards, standing in front of car. Use supplied alcohol tissue to clean and affix transponder midway between park sensor and number plate, above centre line of nosecone. Be sure transponder is clear of black polystyrene moulding inside nose cone! You could certainly fix it more squarely than I did but it was freezing cold and windy! Press nose cone back in place ensuring all clips are locked. Approaching the next toll booth with the transponder on the nose cone of the car, again with backup cash and cards, the response was instant. I barely stopped, the barrier flew open and I was on my way. Success! Note that although the “BIP&GO” transponder has electronics and a lithium primary cell inside, the cell lasts literally years, probably longer than you will own your “S”. My old one still worked after 10+ years. It’s totally sealed so you can forget about it until you sell your car, but must obviously not forget to remove it first! 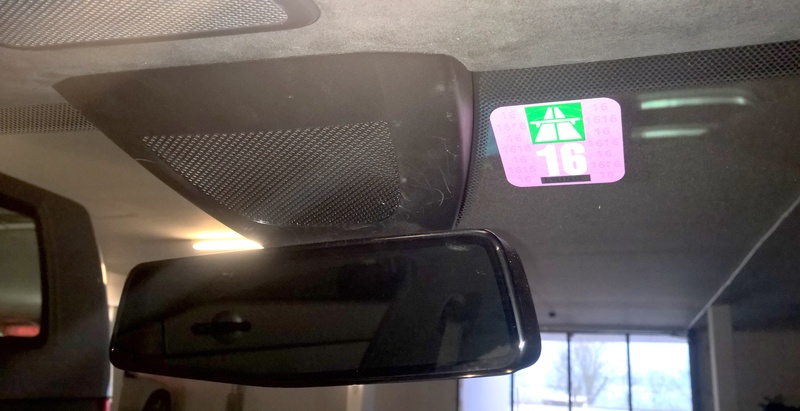 Having the tag right at the front of the car can make it even more responsive at triggering the barriers than normal, though it is possible you may come across a faulty lane or have some other issue. If that’s the case the attendant may ask to see/scan the barcode printed on to the tag. For that reason, it’s worth taking a photo of the tag and keeping a printout in the glove compartment in case that issue arises.